Let's talk about the follea style wig. OK, so we all know about the Follea Gripper Lite and Gripper Actif wigs right? But what's available for you if you don't have total scalp hair loss? What if you have Alopecia areata? What if you have all over thinning and a Topette or topper is not going to work so well as, technically, you still have some hair? The Style of the, erm, Style ... doesn't come in a set style as such. I just said style far too many times in one sentence! Now, Purchasing your first Follea is never (or very rarely!) going to be one of those things that can be done online 100%. Ideally you want to be meeting with your closest Follea specialist (such as myself) so that you can try on the different length options, colours and bases etc. My company, Aspire Hair, is based in Sheffield, South Yorkshire but we can refer you to specialists across the U.K so please do get in touch if you would like to come along to a consultation. As well as the length options above you also have to select your preferred colour. Follea offer a selection of darker shades, mid browns and blonde's so there should be a colour that you like. Follea currently have one red shade available. I really am best showing you when it comes to the cap construction of the Follea Style wig! Style has a lace front that extends past the temples. One of the things we were hearing from our Follea customers was that they loved the lace front on the old collection wigs but they would love it even more if the connection point at the temples was softer and less noticeable. 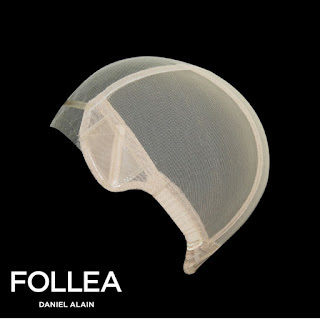 Follea took this feedback and ran with it by doing exactly what wearers had asked for. Style also has a full French top (here in the U.K we tend to call this a silk top with hidden knots). What this means is that the knots used to attach the hair strands to the base on top of the head are hidden beneath lace and silk. They are not visible like they used to be so the parting is now absolutely flawless. The back and sides of the style wig are hand-tied which means you have absolutely no wefts in the construction of the cap. To add strength to this hand-tied cap Follea have double lined it which makes it much more durable and long lasting. PU tabs have been incorporated into the design of the cap at the ear tabs and nape. You can use tape on these areas with less risk of ripping or tearing the base. Tape isn't needed if the sizing is good and you feel confident without it but Follea have put that option their for you so you can decided how you want to wear your hair. A lot of our customers wear their Style wigs with one of our Hair Grip bands and swear by them! So that's it lovely! 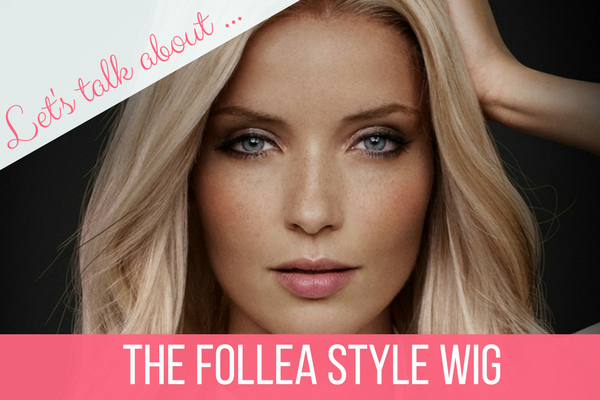 A run down on the Follea Style wig. Do you wear the Style? Do you have your eye on the Style?